I am an attorney specializing in "Lemon Law" and have personally spoken to thousands of people about automobile purchases, new and used. I can tell you the most important thing you can learn from the collective experience of all those people: UNDERSTAND THE IMPORTANCE OF THE PURCHASE AGREEMENT. 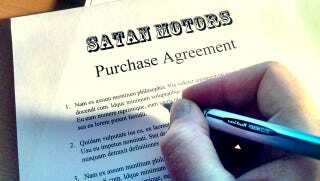 Auto sales are controlled by the purchase agreement you will sign once a deal has been struck. Once you sign it, the deal is done. But most people get so freaked out in a car dealership they overlook the importance of this one piece of paper. Most purchase agreements are pre-printed forms slathered in language no one reads. That would be the fourth paragraph in the clip from above. Yes, that means the salesman can tell you anything; it won't mean a thing legally. "This is a one-owner car." "This car has never been totaled." "This car was not used as a mobile meth-lab before it was dumped in Lake Erie." This means you should ignore everything the salesperson says to you. EVERYTHING. None of it means a thing unless it's reduced to writing. In some states, you can try arguing that the salesman's statements meant something notwithstanding the disclaimer, but it is almost impossible to prove; written statements almost always overrule verbal ones. And for every witness you had with you, there will be five other salespeople who will swear they overheard the exact opposite. "Yes, your Honor. I heard Skip specifically tell the plaintiff that the car was pulled from the crick with a heap of human torsos in the back seat." The good news is that the purchase agreement can be used to your benefit. If the salesperson makes a statement about the car you like, ("This car has a brand new engine.") ask that it be written onto the purchase agreement. Watch the excitement which ensues. They will say, "We're not allowed to write things on the purchase agreement," or "You don't need me to write that down, I'm giving you my word." Better: "You don't trust me?" If they won't write it down, refer to the previous paragraph. The salesperson is lying to you and now you have proof. There is no valid reason a salesperson would hesitate to write a truthful statement onto a purchase agreement. Notice that they don't make this easy. The example above is from a recent purchase agreement and, as you can see, there's not a lot of room for the parties to fill in the "OTHER MATERIAL UNDERSTANDINGS." That's because the dealership doesn't want there to be any. So, next time you go car shopping remember this: Ignore everything the salesperson tells you. Nothing counts unless it's written on the purchase agreement. And if they won't write it there for you, walk away.